Detailing the physical features, habits, territorial reach and other identifying qualities of the Mutillid Wasp. The female Mutillid Wasp is a cunning ant-mimic capable of inflicting one of the most painful insect stings known to humans. Though she looks and acts like an ant, this solitary female wasp is part of a family known as Velvet Ants though they are not ants at all. This particular species is not as hairy as typical Velvet Ants (see Red Velvet Ant and Thistle Down Velvet Ant for comparison). 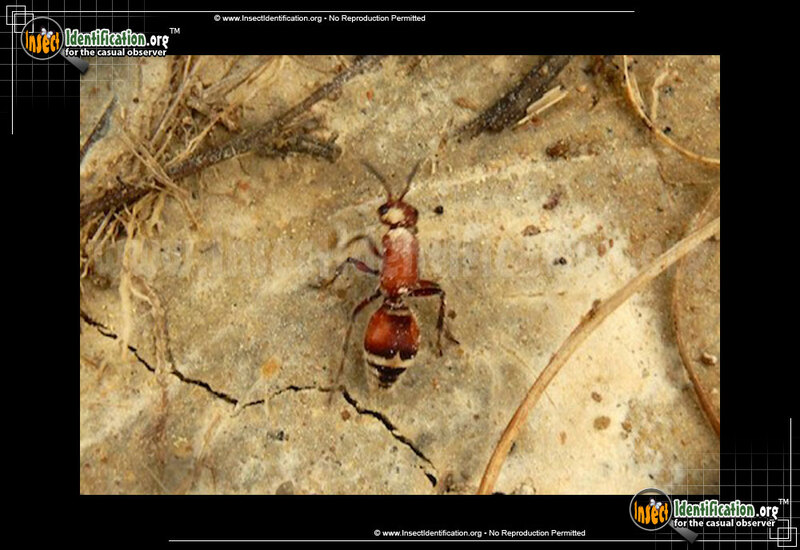 It is extremely tiny for a wasp and looks more like a real ant than other members of the Mutillidae family. Wingless females are capable of rendering terribly painful stings, leaving human victims bewildered and in agony. Examining the antennae of a Velvet Ant helps distinguish it from a true ant. Ant antennae bend in a sharp 'elbow' while this wasp's antennae lack joints from base to tip. Adult Mutillid Wasps drink nectar and water. Wasp larvae, however, are fantastic parasitic predators. The eggs of a Velvet Ant are laid near the eggs of other bees, wasps, or even flies. They hatch and quickly begin to devour the unsuspecting neighbors.